Immersion heater element 6kW 2"
Jaspi Immersion heaters are mainly fitted to the thermal stores for heating back-up, domestic hot water boost and cheaper electricity tariff charging. They can also be used with solar PV panels and wind turbines. 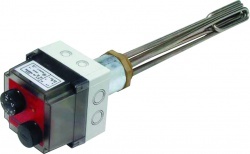 All Jaspi immersion heaters are equipped with three Incoloy alloy heating elements providing faster heat up time, long service life and latency. Heater elements include an integrated thermostat pocket and M4 terminal nuts.